Getting your iPhones to connect into your internal/DMZ network can be quite a challenge. Say you host a secure web server that should only be accessible to users inside your organization. Users on the road need access it but you cant make it publicly available ? Or say your corporate policy says that email is for internal devices only ? VPN may be your only option. 1x PC with 2 nics (I used a VMWARE machine). An old machine would work. Get your machine with 2 network cards (Important). 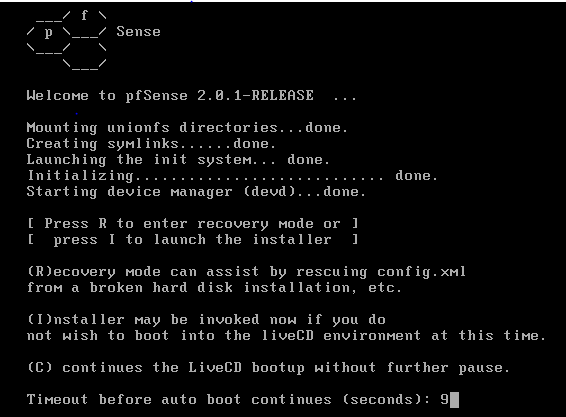 Pop in a PFSense CD, and turn it on. Make sure the pc boots from the CD . Press I for install mode. Quick and Easy install !!!! Yes please! If your installing to a machine with more than 1 cpu press enter here. That’s it OS is installed. See Easy! Once the OS is booted it it will ask you to tell it which interface is its WAN port and then its LAN port. 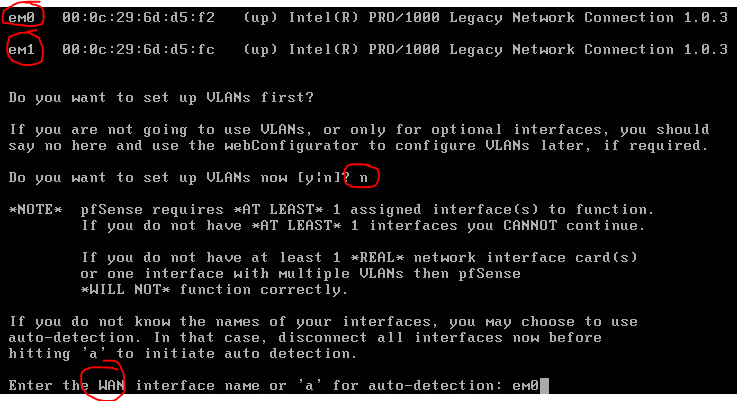 If you want to do vlans (Not covered here) you can. If you don’t have a DHCP server on your network then you can use option 2 to setup the IP addresses for the interfaces. If you need to configure the LAN IP on the correct range. Hover over “interfaces, Select WAN”. Click save and then apply the settings. Then we need to setup a default Gateway for the server. Fill in the options as required. 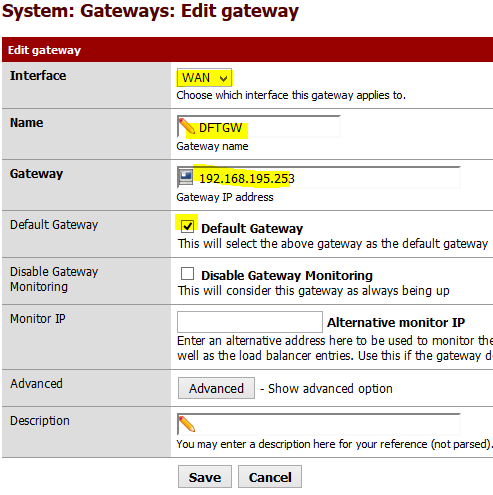 Now go back to the WAN interface and make sure that under the IP address a gateway is set. If not go to the drop down box and select the correct one and save and apply. Hover over “VPN” and Select “IPSec” then select the “Mobile Clients” tab. Click Save, and you will get a box asking you to create a Phase 1. Save that and lets create Phase 2 now. Click the + block under the Phase 1 we just created and then click the add button. Under Phase 2 you only need to take away some check boxes and select 128bit encryption for AES. Make a mental note of the mode and local Network. I’ll explain why shortly. Now Enable IPSec under the tunnels tab. Now its created we can make user accounts to use it. There is a Gotcha to this part. 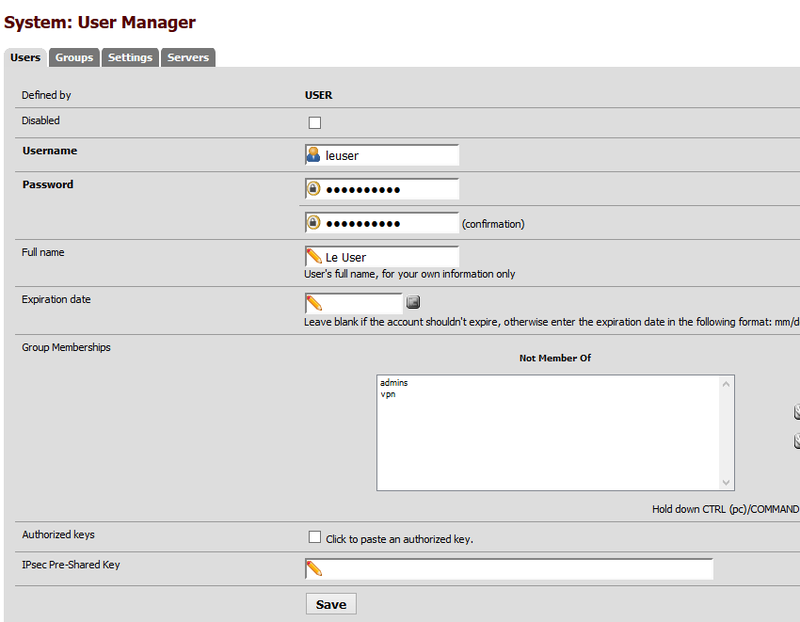 You have to first create the user save it and then go into it again to assign permissions. You can create group save it and go in again and assign permissions to it like that. Click the + button for add and then fill in the details. Now save and re-open it with edit. so lets create a user and add them to the VPN Group. So lets review what was done and what really matters. Virtual Address Pool: This is the IP address pool that your clients will use once connected. Think DHCP for your VPN clients. It’s important that you have enough for the amount of users that are going to connect. Interface: This is the listening interface for the vpn connections. Make sure this interface is available from the internet. NAT Traversal = Force: This wraps the packets in a udp packet so that the ipsec encryption is not broken by NAT. Google this if you want to know more if quite complicated. Mode = Tunnel: Makes the device use split mode vpn. The internet will be accessed directly and vpn is only used for networks advertised by it. Local Network: This is where your VPN users can get to. This would be considered your DMZ for VPN users. You could do some routing magic to make it get to all networks, but thats outside the scope of this article. If you are going to use NAT (Port Forwarding) to publish the VPN server you will need to use ports 500 and 4500. 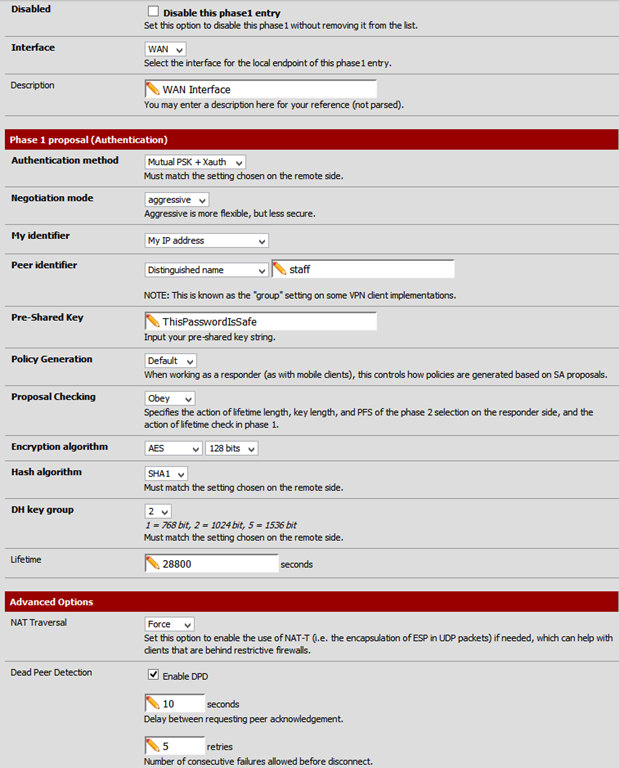 You need to allow the connections on the firewall of the PFSense server. This is really easy so im just going to wiz past it. Under WAN Add 2 rules. One to allow TCP/UDP port 500 to the WAN IP. Under LAN i just allowed everything. 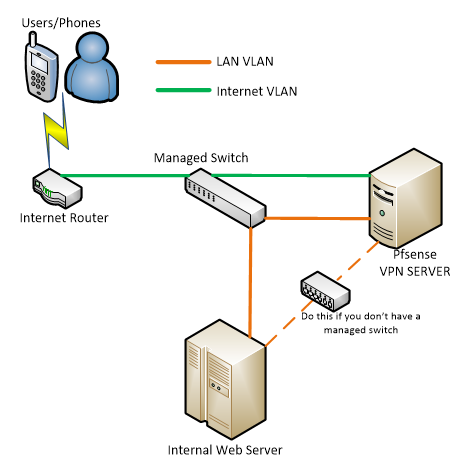 Under IPSec do the same as on LAN. If you are going to use this in production i suggest that you play with the rules and make sure they are secure before publishing this. Setup on the iPhone is pretty straight forward. Hit save and you should now be able to connect. Step 5: TEST TEST TEST! 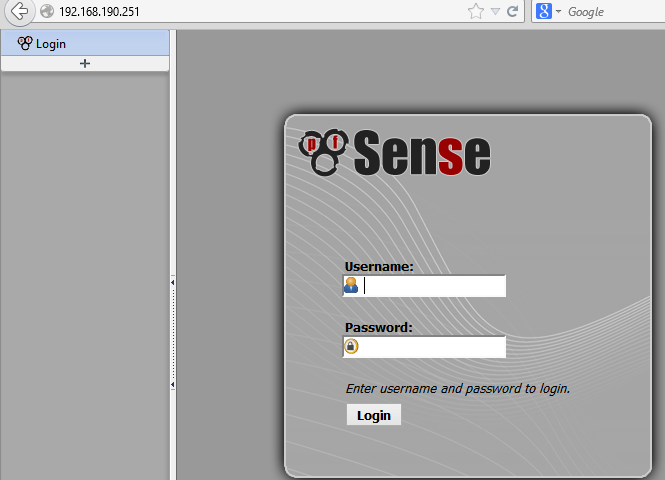 I used a centos web server to make sure that i could see “internal” servers resources from the iphone/ipad. if you do decide to do this remember to make sure iptables is either off or allowing the connection. You can use this on a windows/linux machine with the free shrew client. see below link. Now that you have the basics down. dont be afraid to break it. This whole process once you know how to do it will take no more than 20 mins to setup. 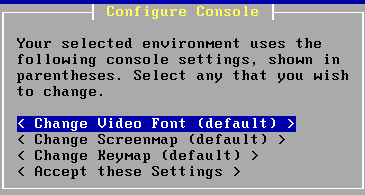 Or use a vm and make a snapshot once you are happy with your base config and work from there. 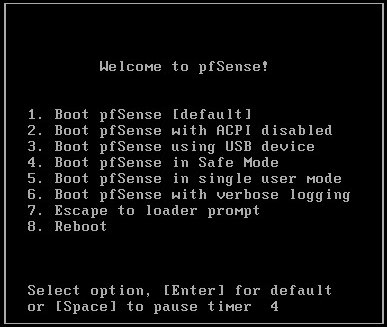 Remember also that PFSense has many more applications than just VPN. If you hover over “System” and select “Packages” then “Available Packages” you will see all the add on packages you can use.